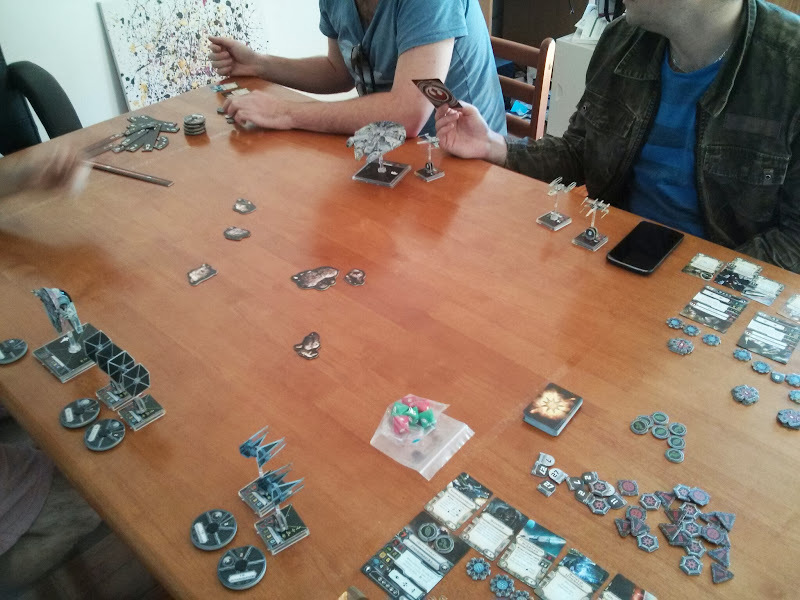 My brother, cousin and a friend came around over the weekend and we cracked out the X-Wing miniatures game, and the Battlestar Galactica board game. It took a few hours, but it was time well spent. 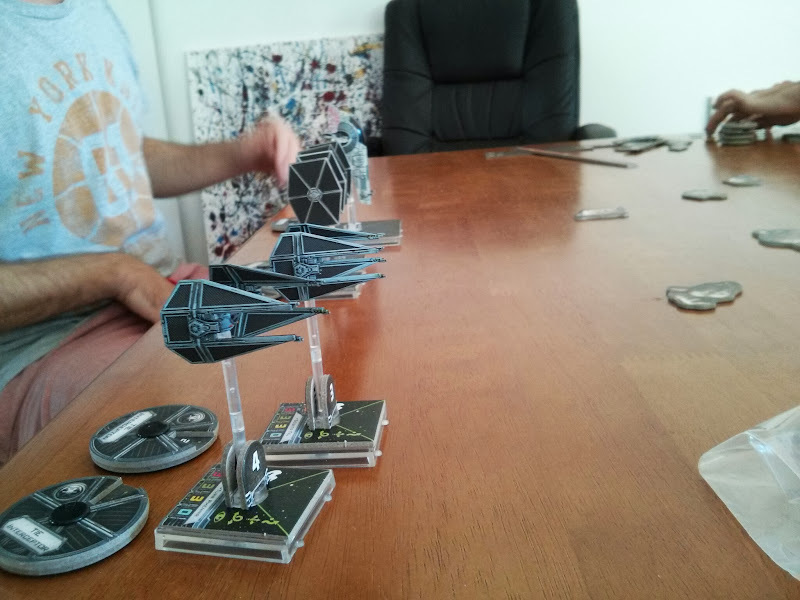 My brother (Scott) and I had played X-Wing plenty of times before, but my cousin (Ryan) and his friend James had not. So we decided to have a game of 2 on 2. Scott and James vs Me and Ryan. Scott and I built the sides, since we knew what we were doing, and then randomly assigned who took which force. We found we didn’t have enough miniatures to make a 200-point force on the imperial side, so we made it 150 points each. For the Rebels we had Chewie in the Millenium Falcon, Biggs in the Y-wing, Luke and Wedge in X-Wings. Scott controlled Biggs and Luke. James had Chewie and Wedge. 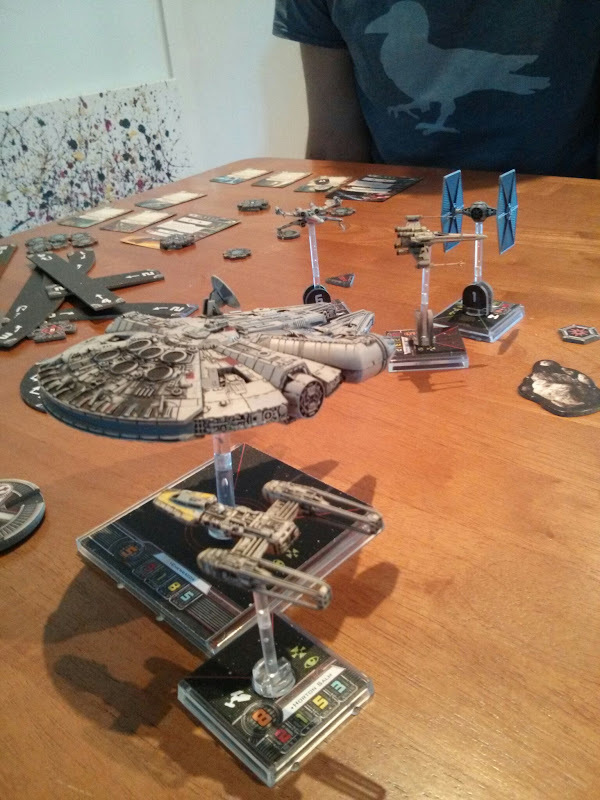 On the Imperial we had Kath Scarlet in the Firespray, Soontir Fel and Turr Phennir in TIE Inteceptors, Night Beast and Mauler Mithril in TIE Fighters. Ryan controlled Kath and Night Beast, while I took Soontir Fel, Turr Phennir and Mauler Mithril. Ryan and I decided that our tactic would be for the firespray to lead the charge, while the TIEs flew in formation behind. Deciding the asteroid field presented too much of an obstacle in the middle of the field, we’d fly on the left, and try and focus on the Y-Wing first. Its 360-degree ion turret is very annoying, and although a tough ship, it should wither under the combined firepower of all our ships. The Falcon also has a 360-degree turret, but it’s just too tough to focus fire first. Things started well enough, with a nice smooth opening move, however from there it went poorly. Ryan flew Night Beast into an asteroid, where he remained mired for 3 turns (!) I made a great barrel-roll move with Soontir Fel to get a clear shot on Wedge, while avoiding his fire. Unfortunately, I forgot the order of play and after I fired, I used Daredevil to barrel roll back into his path. I thought he’d already fired, and the barrel roll would have set me up for a better run through the asteroids. Proton torpedeos and general focus fire hurt Kath badly. Perhaps I should reconsider not focusing the big ships. They are simple to get within a firing arc, and they are pretty brutal unattended. Kath didn’t last much longer, and Night Beast – having just escaped the asteroid field – promptly crashed into a friendly. All in all he had 5 turns, 3 in an asteroid field, 1 crashed into a friendly, and 1 with a stress token. It was not a good day. At the end, there was only Mauler Mithril left, and not a single Rebel ship was down. Sticking to the original plan, I was able to dispatch the Y-Wing and one turn later, the Falcon finally removed the pest. Well, after all that we set up Battlestar Galactica. 4 players isn’t the best balance, because we need a sympathiser or something similiar. So next post – BSG with Pegasus expansion and a Cylon Leader. Tune in to hear the scandal of Detector-Gate. You got the rebel side wrong: Chewie in the YT-1300, Biggs and Luke in the X-wings, and Horton Salm in the Y-wing. I had Luke with a R2-F2 (I think, the agility droid) a stealth device and elusiveness. Biggs with R2-D2, and Horton with two proton torps, a fix a crit droid (whatever he’s called) and the ion turret. I can’t really remember all the gadgets I had on Chewie. and I controlled, Biggs and Horton. The Y-wing and lesser X-wing. Playing with four players is pretty interesting, having to give some thought to what your own team-mate is doing as well as trying to out manoeuvre the baddies. Also, even though I feel we played well and you guys played poorly, we also seemed to have the luck of dice on our side. I don’t think I’ve EVER rolled that well, and James just simply didn’t know how to roll a blank.